Damo and Vikki's Round the World Trip! : Vietnam Highlights! This meant we could be away for an extra 6 months and also get jobs in Australia, woo! 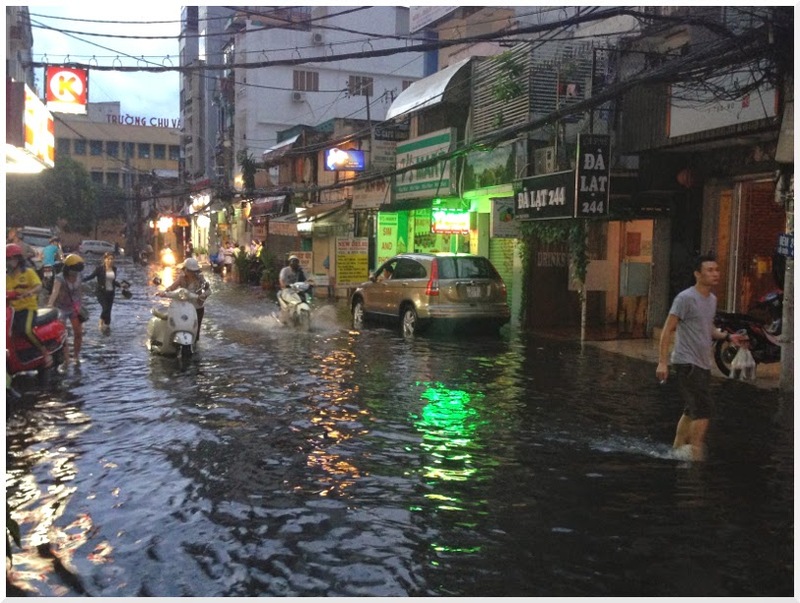 We left on the 2nd November and flew to Ho Chi Minh City, then took another flight to Hanoi in the north. We spent all day travelling and finally checked into the hotel at midnight! I woke up at 6am and this is what it looked like outside, I was so excited to get out there and explore!! We went for breakfast in the hotel and had sausage bacon and omelette which I didn’t expect to be eating in Vietnam! Then we set off! There were motorbikes everywhere and crossing the road was so scary! There were people all over the street, selling things, making food, and eating! We headed for Hoan Kiem Lake, also known as the Lake of the restored sword and decided to walk around it. We got stopped by some students who were being filmed and wanted to ask us some questions to practice their English, they were so lovely and we chatted to them for ages! I think they only understood about 10% of what we said though! We had to cross a red bridge to get there and it was really pretty. We then went and sat at a street food place and I tried Pho for the first time! I had a beef version (Pho bo) which is the most popular and it was so yum! And only 30,000 dong! Damo had noodles and a beer, we then went and bought some pineapple from a lady selling them on the street for 10,000 dong and she cut it all up as well. So cheap!!! After that we made our way down to the Hoa Lo prison, better known as the "Hanoi Hilton" which is what it was called by the American prisoners of war during the Vietnam war. A lot of the building has been knocked down but it was still really interesting. 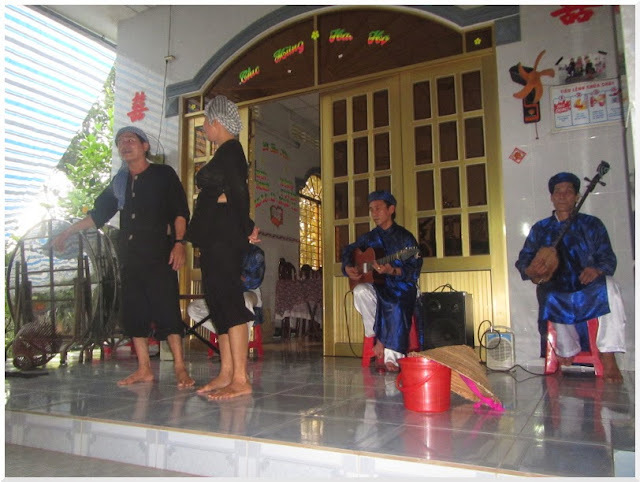 We then headed back to the lake and saw the Thang Long Water Puppet theatre so we decided to go and watch the show. It was definitely different!! Lots of strange singing and a story being told which I didn't follow at all! It was fun though and I'm glad we saw it! 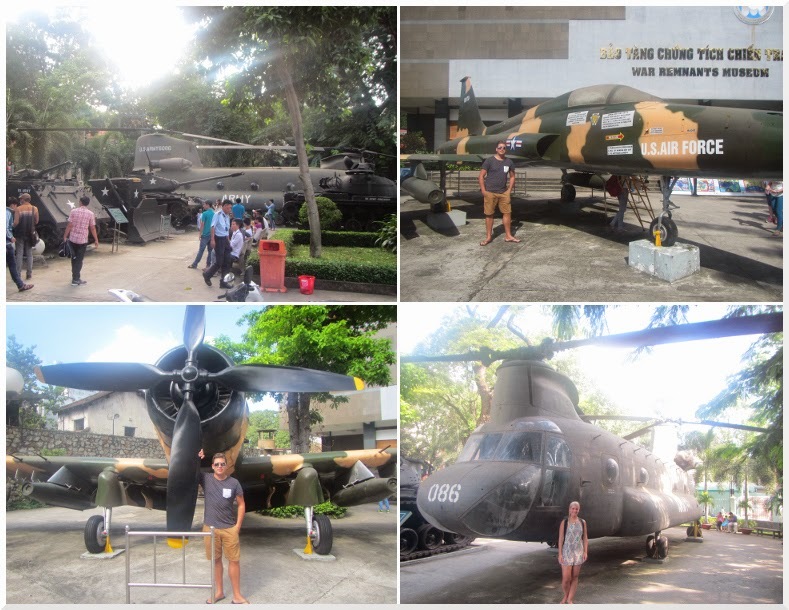 The next day we walked to the Military Museum, where we saw captured US planes, helicopters, tanks, guns and bombs from the war. We then carried on walking up the road and saw the Ho Chi Minh Mausoleum, which was closed for some reason, and went to the One Pillar Pagoda. We were also going to go to the Presidential Palace but we couldn't find it! We then went into the botanic gardens, and went to look at another temple called Chua Tran Quoc. By then our feet were aching so we went back to the hotel!!! That evening we went on a food tour which we booked through our hotel. We had a guide who met us at the hotel and it was just us and 1 other couple who were Irish and were really nice we had such a laugh with them! We went round loads of different places eating so much food! It started at 6pm and we didn't get back till after 11 even though it was meant to finish at 9! We drank bia hoi (beer!) and ate pho, vermicelli with eel, banana flower salad, rice paper rolls, sticky rice and loads more. We also had some dipping sauce which we then added a tiny drop of oil to, and it completely changed the flavour. We then got shown where it came from - a cockroach looking bug! Urgh! The essence is what the male bug produces to attract females! We finished by heading into a coffee shop which was down a small alleyway. It was packed full of people and everyone was eating sunflower seeds and throwing the shells on the floor, it seemed like it was the thing to do so we did it too! We then got given egg coffee, which sounds gross but it was my favourite thing we had on the tour! 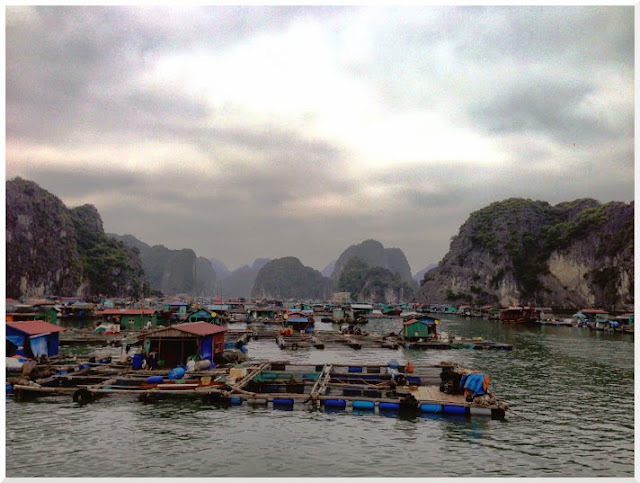 The next day we got picked up from the hotel for our trip to Halong Bay. We did the trip with Golden Lotus who were great as well as a really good price compared to some of them! We did a 2 night trip, with 1 night being on the boat and 1 night on Cat Ba Island. From Hanoi we had around 4 hours on a coach then we all got on a small boat which transferred us to our main boat where we would be sleeping that night. It was so nice, I kind of expected it to be like the boat we went on in the Whitsundays but it was 100 times nicer than that! After checking into our rooms and having some lunch we sailed towards the "Surprising Cave" looking at loads of the rocks on the way including some that looked like 2 chickens kissing! It is such a beautiful place! The cave was awesome, there were 3 different sections and each one was bigger and more impressive than the one before, which is how the cave gets it's name. There was also an amazing viewpoint out over the islands. 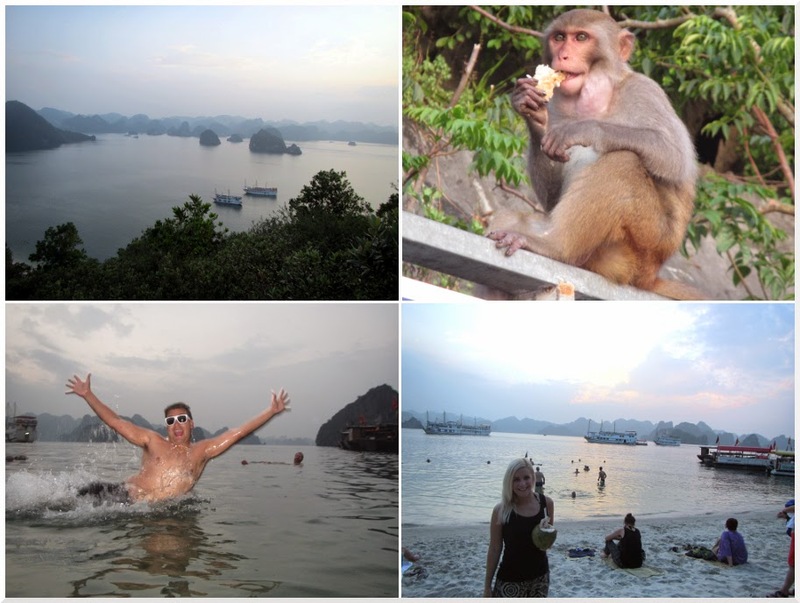 We then went to a beach where there were a few wild monkeys and another viewpoint which we walked up to. We walked back down and just chilled on the beach and went in the sea. That evening we made rice paper rolls then after dinner had a go at squid fishing. 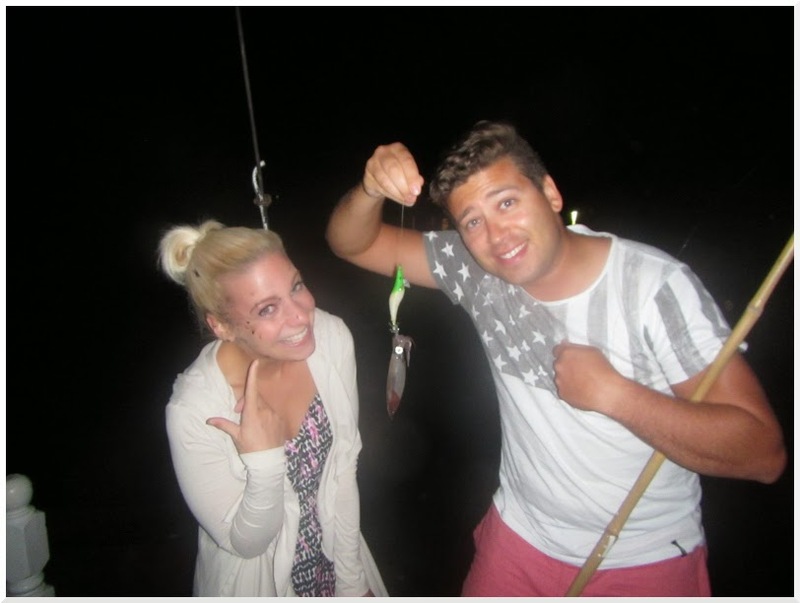 Damo was the only person that managed to catch one, he pulled it out the water and it inked all over my face and hair!!!! The following morning we went kayaking around the islands which was amazing although we got rained on! We then transferred to a smaller boat with one other couple, as the rest of the people on our boat were just doing a 1 night trip but we were doing 2 nights. 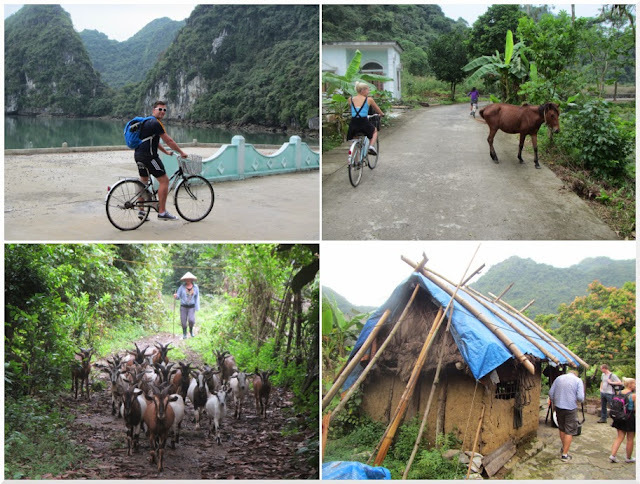 We got taken to Cat Ba island, where we got on bikes and cycled to a village which was great! We stopped at a house on the way which was made of clay and straw and got given a shot of rice wine by the owner! Carried on a bit further then got off our bikes and went hiking through a forest and cave. After heading back to the boat for lunch we went to Monkey Island. 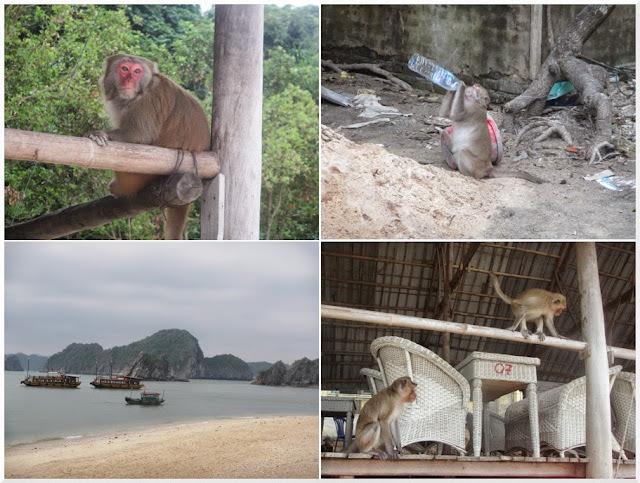 The monkeys here were a bit cheeky and funny to watch, but they also steal things so we had to be careful of our bags! I had a banana in my bag so Damo gave it to a monkey and we also gave him our bottle of water! A lady was stood on the beach taking photos of them, when another monkey that she didn't see came walking up to her and bit her on the leg! She fell backwards with the shock of it and literally did a roly poly down the beach! We felt so bad for her but it was kind of funny, oops! After that we got back on the boat and made our way to the main Cat Ba town, as we made our way through the harbour there was a huge floating village, one of the guys on our boat told us that some people spend their whole lives there and never live on land! Crazy! We had a short bus ride to our hotel, the Sea Pearl. The room was huge and had an awesome view of the beach! We had a bit of time before we had to meet back for dinner so we went for a walk down the road and got a 10 minute back massage for 20,000 dong! 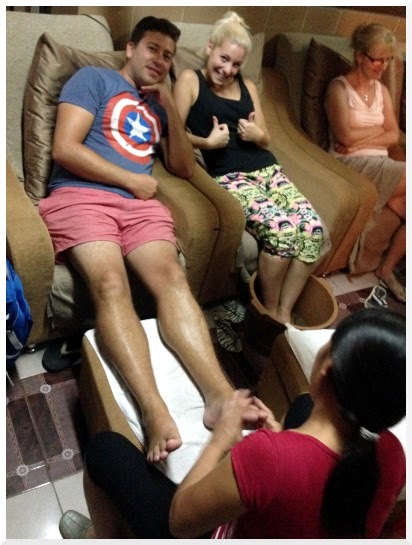 It was so good that we decided to get foot massages as well! We then went for dinner then had 2 for 1 cocktails in the bar downstairs with another couple from our boat! 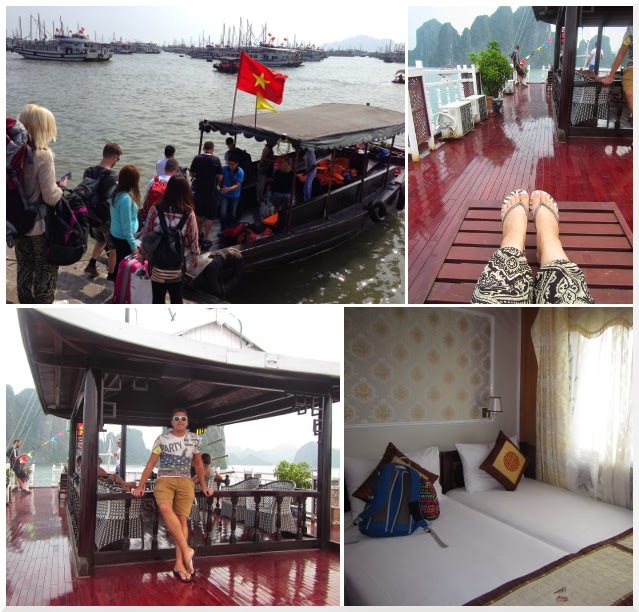 The next day we went for breakfast at the hotel then spent the day travelling back to Hanoi which was 2 boats then 1 bus. We went for dinner at a place called New Day as we’d heard lots about it and it was so nice! After our final night in Hanoi we flew back down to Ho Chi Minh City (Saigon) and got a taxi to our hotel, Duc Vuong! We chose the hotel because it’s where my niece stayed when she was there with her boyfriend. The hotel was amazing, the second our taxi pulled up the staff were there getting our bags for us and they were all so friendly! The hotel had amazing free breakfasts and an awesome rooftop bar with great city views! We booked a load of day trips through the hotel as they were all only a few dollars each, and on our first full day we did a city tour in the morning. This took us to the War Remnants Museum, which had lots of things from the Vietnam War (a bit like the one we went to in Hanoi.) There was a big chinook, planes, tanks, guns! We had a group of about 30 teenagers ask for a photo with us and it felt like we were famous!! There was also lots to see inside, including some awful stuff like how prisoners were tortured and photos of victims of Agent Orange - a chemical which was dropped on the jungle by the US soldiers during the war. It was used to clear the jungle, to expose the Viet Cong who were hiding in there, but exposure to the chemical caused people to have children and even grandchildren born with deformities. There were awful photos and even a fetus in a jar with 2 heads which was slightly disturbing! 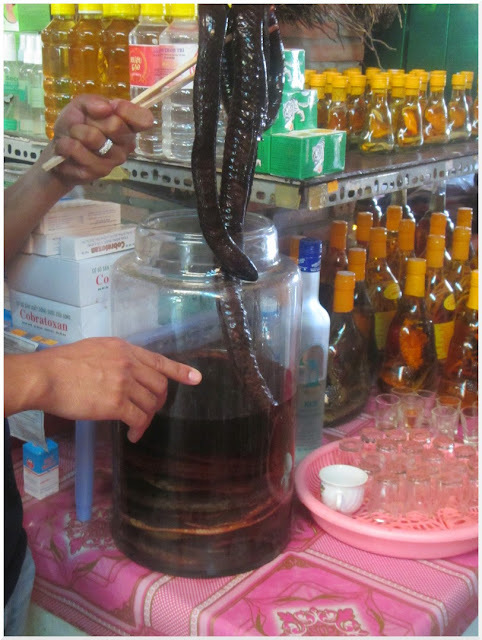 We then went to a place where we tried some weasel coffee, which is a delicacy in Vietnam and is basically made from coffee beans which have been eaten and pooped back out by weasels! Apparently they choose the nicest beans to eat and something happens to them in their stomachs which makes it nicer than normal coffee! After that we headed to a big Chinese temple, and the final place we visited was a huge wholesale market. 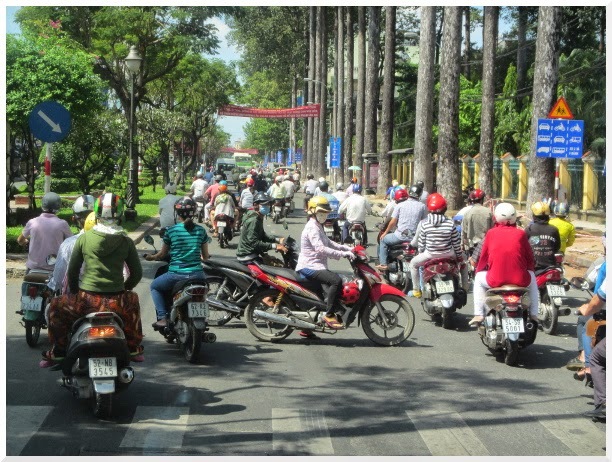 We soon realised that the roads here were even busier and packed with motorbikes than the ones in Hanoi!! This ice cream shop had an interesting name.. so we thought we'd go in to sample some Fanny and it was yum!!! After that we headed to the Saigon Skydeck, which is at the top of the Bitexco Financial Tower - the tallest building in the city. The views were great and we stayed up there til it got dark so we could get photos of the sunset and the city all lit up. We then went back and watched the Stoke football game in a place called the Spotted Cow, which was just like being in a bar back in Sydney or at home! 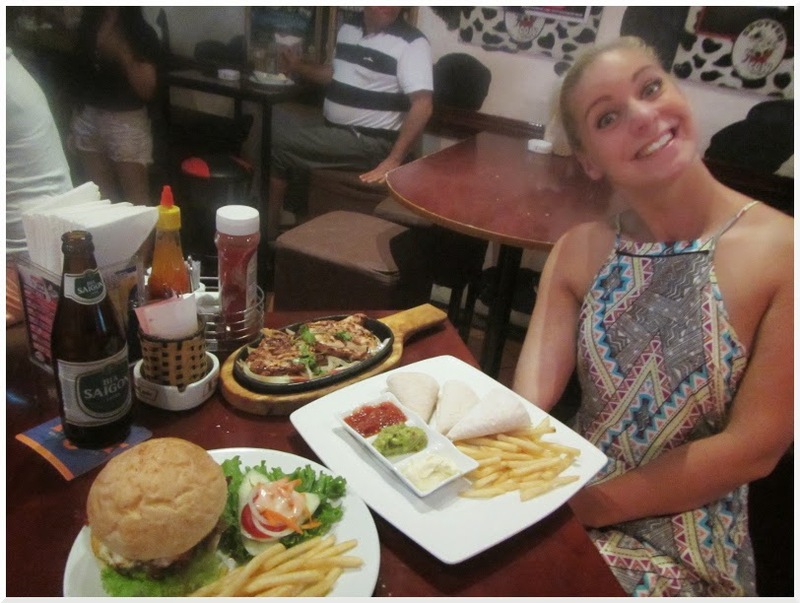 We even had a burger and fajitas for dinner, which I think I was a bit excited about, judging by my face lol. 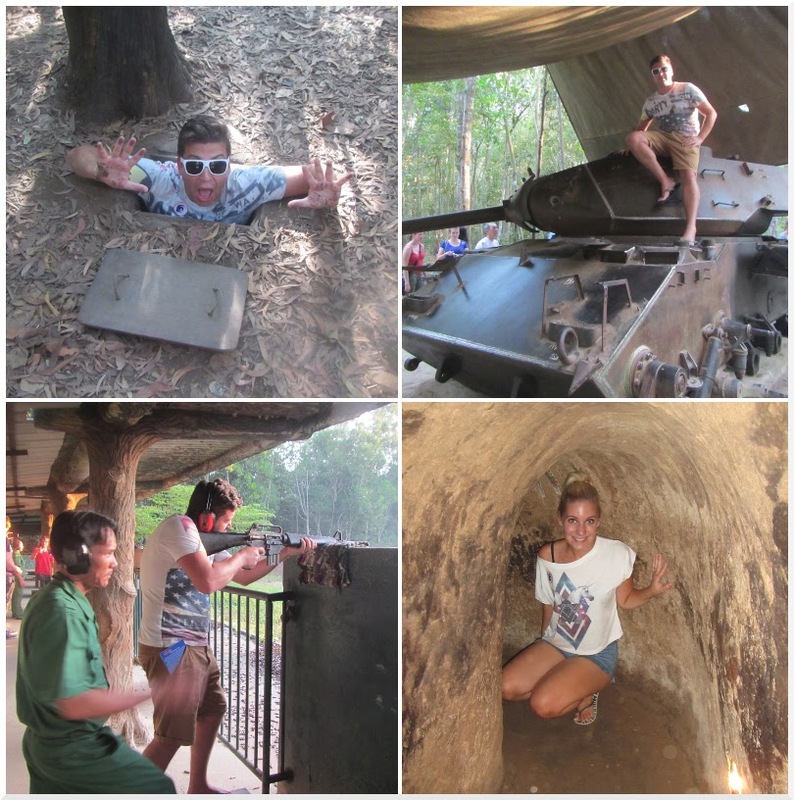 The next day we visited the Cu Chi Tunnels, which are a huge network of underground tunnels that were used by the Viet Cong during the war. It took a few hours to get there and we stopped on the way at the beautiful and huge Cao Dai Temple! The Cao Dai is a fairly new religion which is made up of 4 different religions all praying together, and originated right at this temple. We were there in time to watch the 12pm service. You had to take off your shoes and leave them a few metres from the doors and walk over the ground which felt like red hot lava from the sun to get inside! We felt kind of like we were intruding but there were so many other tourists there and I guess they were used to it! After the service we headed back to our tour bus and carried on the journey to the tunnels. Our tour guide, who was called Mr Bean, was hilarious and had so many stories although I’m not sure how many were actually true! He had moved to the US at a young age and ended up coming back to fight with the Americans against Vietnam, which was interesting to hear about and awesome that he had actually been there and knew what really happened. After arriving at the tunnels the first thing was watching an awful quality 10 minute video, I have no idea what it was about! We then got to see some of the traps used, and got to climb into a small tunnel entrance. We then had the opportunity to shoot a gun for only a few dollars, most people did it but it kind of scared me so I just watched Damo do it. We then had the opportunity to go through the tunnels, which have actually been made bigger to allow for tourists to fit through them!! I was not going to do this as the thought of it made me feel totally claustrophobic but I went back and did the first part, and luckily there were chances to get out every few metres! We really enjoyed it here and I liked it a lot more than I thought I would! The following day we visited the Ben Thanh market which was so funny, the shop assistants grab you and try to get you to buy stuff, I was just ignoring them but Damo was giving them all answers which made it even funnier, we didn’t even buy 1 thing as all the prices were doubled compared to other places! 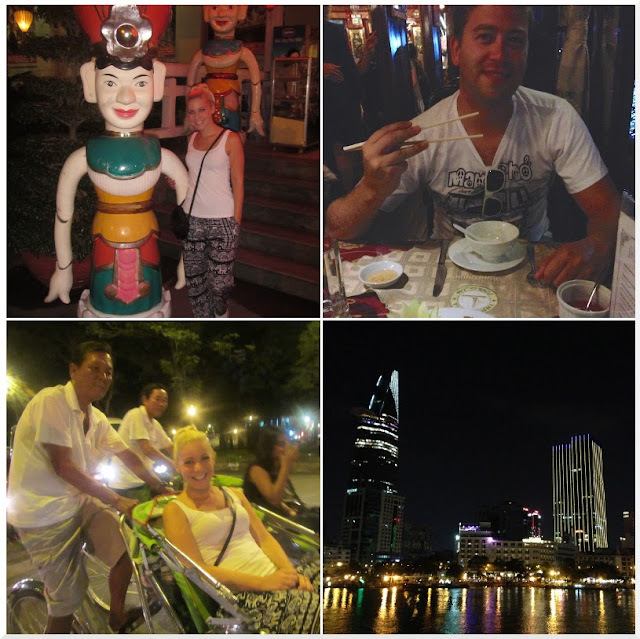 That night we had a ‘city night life’ tour booked which included a water puppet show like the one in Hanoi, a cyclo through the city to the Saigon river where we got on a boat for a dinner cruise! There were lots of food courses and some traditional dancing as well so it was great! 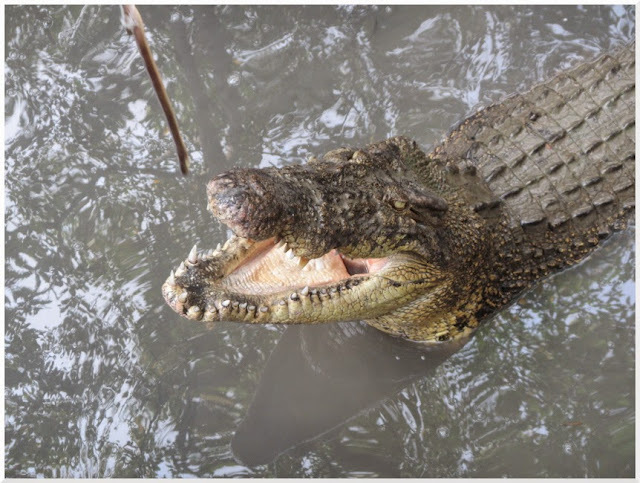 The next tour we did was to Can Gio island, which is full of monkeys and crocodiles! After seeing the lady get bitten by the monkey in Halong Bay I was a bit nervous, but these monkeys were a lot more friendly and playful. The guide held up some peanuts and they climbed all up Damo’s back and onto his head! Next we headed over a really rickety-looking bridge which had planks of wood missing from it - and below us were a load of huge crocodiles!! You could dangle a stick over the edge with an eel on the end and they jump out the water and grab the eel! Every so often there would be a big commotion in the water where they were fighting with each other! Eeeek! We then got a speedboat through the mangroves and learned a bit about how the Viet Cong had hidden there. 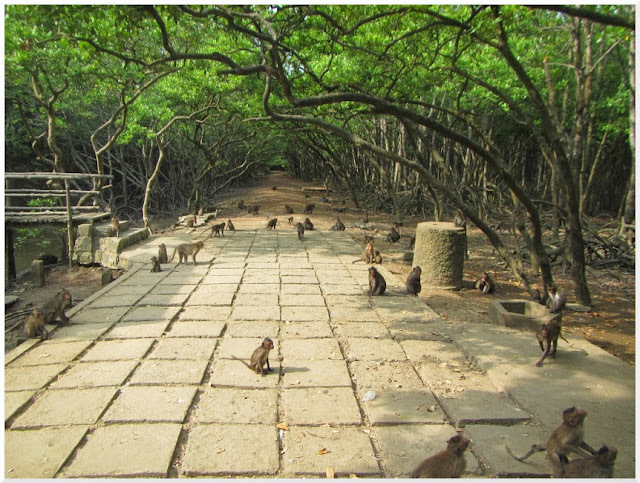 We then arrived back to where the monkeys were and got to spend a bit more time with them. It was an awesome day trip, we loved it! The final tour we did was a day trip to the Mekong Delta. We had read that to make the most of seeing it you really need to do an overnight trip but we only had time to fit in the 1-day, and it was the most disorganised tour ever! Before we had even left, we had to change buses 3 times! Finally we were on our way and our tour guide started talking on a microphone which was really muffled, plus he was a lot harder to understand than the guides we’d had on the other trips, so I have no idea what he was talking about! 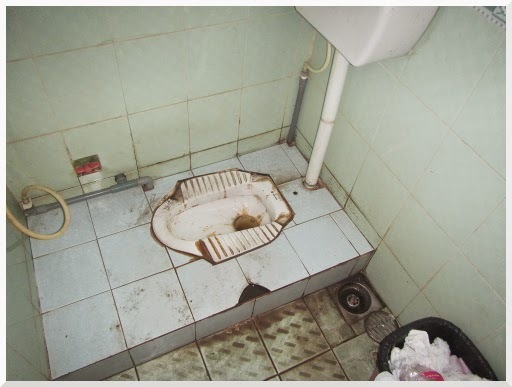 I was desperate for a wee the whole journey and when we finally got off the coach and I found a toilet this is what it looked like!! We then got onto a boat and went to the floating market. It’s packed early in the morning, but when we were there it was just a few boats selling stuff. We pulled up next to one selling fruit and we could climb onto the boat to have a look! We also got to try some jackfruit and some mango. We got off the boat at a village where we watched people making things like rice paper, coconut candy, rice wine and things that tasted like sugar puffs! I guess it was all just to get us to buy stuff but it was nice to try it all! Damo even tried some of this snake wine!! We then carried on to another place which had bees and we tried some honey tea. Then we had some lunch which was the tiniest portion ever and ‘soup’ which was basically hot water with 3 tiny pieces of carrot in it! Haha! In our itinerary it said we then go cycling, but half the bikes were broken so we walked instead and chatted to 2 guys from Sunderland who were really nice. 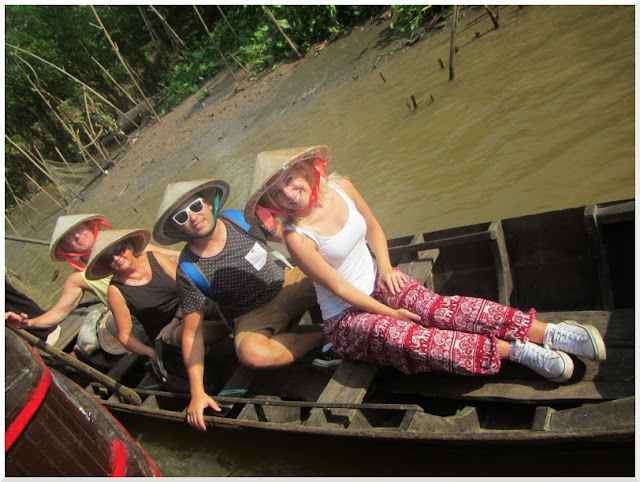 We then got onto smaller rowing boats and put on traditional Vietnamese hats to go down a smaller part of the river! We arrived at what seemed like someone’s house and were given more fruit and tea, then watched some “traditional singing” which was really odd, we had no idea what was happening and at one point a man was pretending to go fishing and he got out a plastic wind up Nemo toy, it was super weird. We got back onto the bigger boat which took us back to the bus. Some people were doing the 2-day trip so those of us doing the 1-day were changed to a different bus to get home. It was already full of people and the man who seemed to be a tour guide for the other group shouted and swore at our tour guide because they had apparently been waiting for us for 2 hours! Overall I’m glad we saw the Mekong Delta but it was our least favourite trip by far! That night we went and got a Banh Mi, which is basically a Vietnamese pork roll, from where is meant to serve the best Banh Mi in Saigon! The place doesn't really have a queueing system and we just had to kind of wait till we were served, paid and got our sandwiches in bags. We took them back to the hotel to eat them and they were so good! Although maybe I shouldn’t of got chilli as it was the hottest thing I’ve ever eaten!! The following day we caught the Giant Ibis bus to Cambodia! 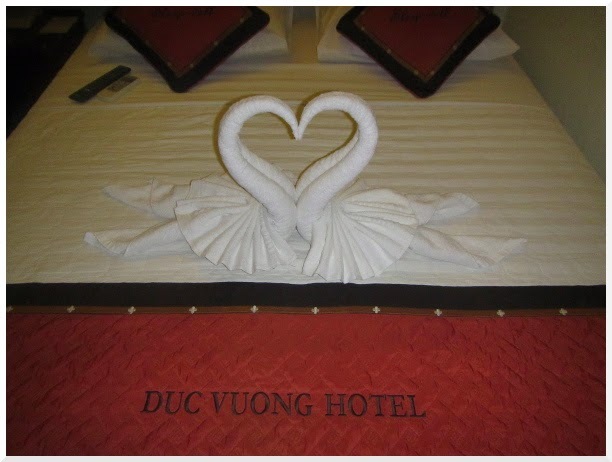 At the end of our Cambodia trip we came back to the Duc Vuong Hotel for 1 night before flying back to Sydney. On our last day we went to a spa on our road called Beautiful Saigon Spa for full body massages, to use up the rest of our dong! Our flight wasn't till the evening so we had some drinks in the hotel's rooftop bar, then it started hammering down! When we went downstairs to get our taxi to the airport, the road had literally turned into a river! We went to the airport and got our flight back to Sydney! 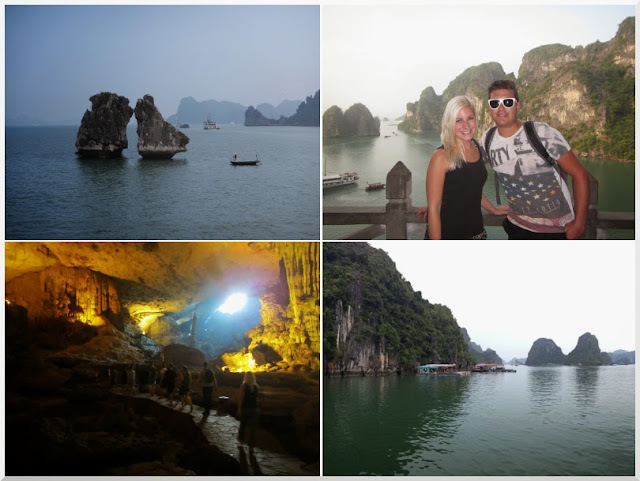 We both loved Vietnam and Cambodia and can't wait to explore more of South East Asia! Hi Stan, thanks for reading! :-) Yes, that was the only rain we saw the whole time, maybe we were pretty lucky but I think you'll be fine! Enjoy your trip! What is the name of the Bahn Mi?? We are headed there this weekend, looked soooo good. 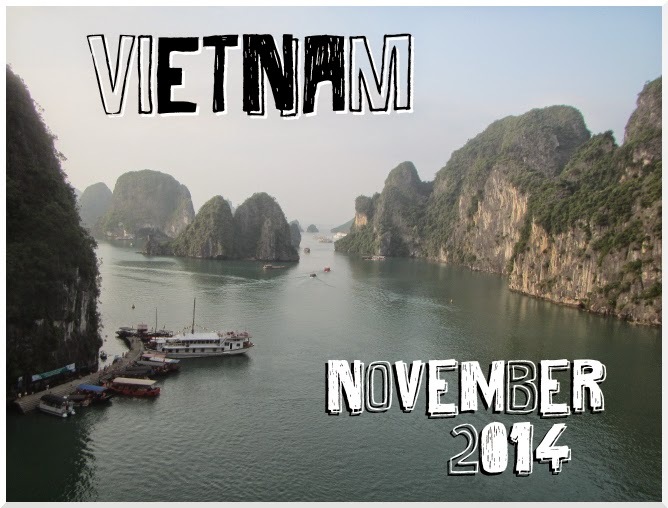 Love the blog, we are heading to Vietnam Nov 2015, and interested in the weather as Stan was. Have been put off going to the beach resorts as they say its the rainy season, but maybe just the odd heavy downpour and then the heat. What sort of temp was it during Nov.